Turn your passion for stand up paddling into a successful business opportunity! Lessons, rentals, and even sales opportunities exist in the fastest growing sport in the world! Wether you have and existing location or wish to go mobile, we can save you time and money with our "turn-key" business options. It is important to note that this is not a franchise, nor are there any costs associated with a franchise. We have simply drawn from our extensive business experience and industry contacts to create a number of packages to suit your needs. Considered a "pioneer" in the stand up paddle industry, as well being recognized as Canada's very first professionally certified stand up instructor, Paddle Surfit founder Bodie Shandro first embraced the sport of Stand Up Paddling in 2008. Since then he has instructed thousands of first time, aspiring and elite enthusiasts and certified hundreds of instructors from his home on beautiful Heffley Lake BC, in California, Australia and the Caribbean. Considered a veteran SUP competitor, Bodie is one of the first Canadians to have raced in some the world’s most prestigious and demanding events, including the Battle of the Paddle California and Hawaii, Paddle Royal in Puerto Rico and WhaSUP VI in St Thomas! On July 31st 2011, Bodie became one of the first Canadian stand up paddleboarders to successfully navigate the “Channel of Bones” in the SUP World Championship 32 mile race from Molokai to Oahu! Bodie was one of the first ASI “Master Certified” SUP instructors by the World Stand Up Paddleboard Association, is one of Paddle Canada’s first Instructor Trainers, and is a PSUPA, Professional Stand Up Paddle Association Advisor, Trainer. He is a Professional Ski Guide and CSIA Instructor, Professional Mountain Bike Association Certified Instructor, in addition to holding numerous other sports, fitness and outdoor certifications. Additionally, Bodie has acquired over 30 years of business experience in the surf and ski industries. From serving as surf giant, Rip Curl's Canadian CEO, to Surftech Canada's current sales representative, he has amassed years of knowledge in product development marketing and brand management. Professional instructor certification courses from either Paddle Canada or the Professional Stand Up Paddle Association. 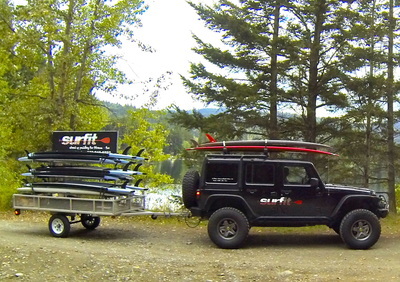 Boards, paddles, leashes, PFD's, and all equipment needs at discounted prices from industry leading brands. Instructor manuals, waiver forms, waiver execution documentation, rental documents policies and procedures. - SQUARE, mobile point-of-sale device. Accept credit card or debit payment anywhere. - Marketing strategies and assets that include brochure templates, webpage design, social media, photo and video library, stickers, signage, flags, tents. - Branded uniforms, paddletops, caps. - Comprehensive coverage through international industry leading providers including 3rd party liability, commercial liability, and equipment loss. - Risk Management Plan template and consulting.